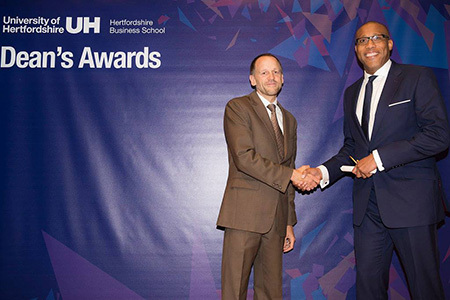 Haines Wentworth Consulting’s Colin Mattis and final year MBA student was the successful recipient and winner of the Intellectual Curiosity Award at the Hertfordshire Business School’s Dean’s Awards Ceremony 2016 held at the University of Hertfordshire’s De Havilland Campus on 11 October. Colin is pictured (right) here receiving his award from the Dean of Hertfordshire Business School, Professor Damian Ward. This prestigious award recognises and is presented to the Business School student that has demonstrated a true passion for learning and a willingness to share knowledge and encourage this in others. This accolade was awarded to Colin by the judging panel because of his great intellectual curiosity in both his MBA studies and his translation of that study into practice with a focus on the legal services sector. Colin is now completing the final part of his MBA – Applied Individual Project (AIP), where the focus of his AIP is on the management of legal projects and innovation. Colin’s next speaking engagement is in December at Hennik Research’s Connect BI conference (part of the Hennik Group (www.hennikgroup.com)) where he will be discussing the importance of business intelligence, data and the impact on business transformation. For more information about the services offered by Haines Wentworth Consulting and how they can assist your team or your organisation, please email info@haineswentworth.com or visit www.haineswentworth.com.